I was on the phone chatting in the living room and one of my cats "Teddy" jumped off the sofa to do some sun bathing. No time to do a fancy set up so I just snapped a quick shot. With Easter nearing I have set up an Easter Egg tree and I caught a shot with a little sunshine on it. My Mom always put one together when we were kids and I've revived the tradition in my home now for several years. Teddy had been enjoying the sun until it moved off. 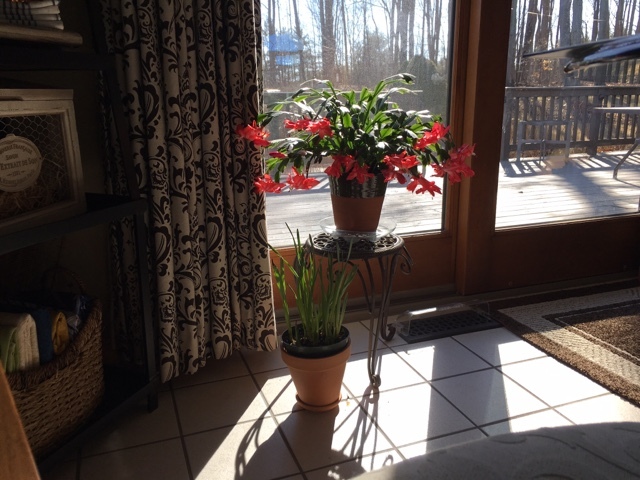 The Christmas Cactus is still blooming. The daffodils that I had brought in from outside (and talked about in my last post) have grown a lot taller but there is no sign of any flowers coming yet. It is a nice sunlit morning today. 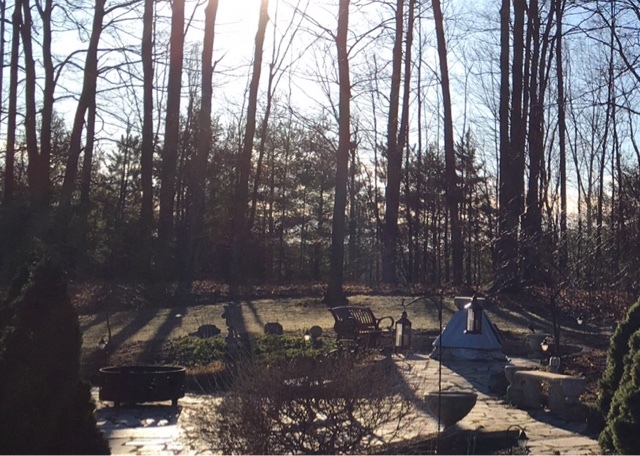 A frosty sunlit morning! Even though it's a bit early we put out our patio table and umbrella last weekend. To say we have cabin fever is an understatement! Your Christmas cactus is really handsome. And so is Teddy!Enjoy the coming Easter! What a lovely post, Liz! 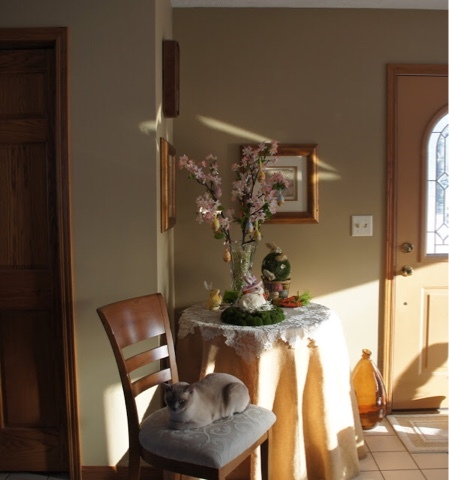 Your sunlit kitty looks so happy and your home and patio look ready for spring. Soon it will be so pleasant to stay in your garden! Love the pastel shades of your beautiful Easter tree. Wishing you a happy Sunday and a serene Holy Week! Teddy is so adorable and I love your Easter vignette. If my kitty is sleeping in his basket and the sun moves, I move the basket with him in it ... LOL! Teddy has the right idea. 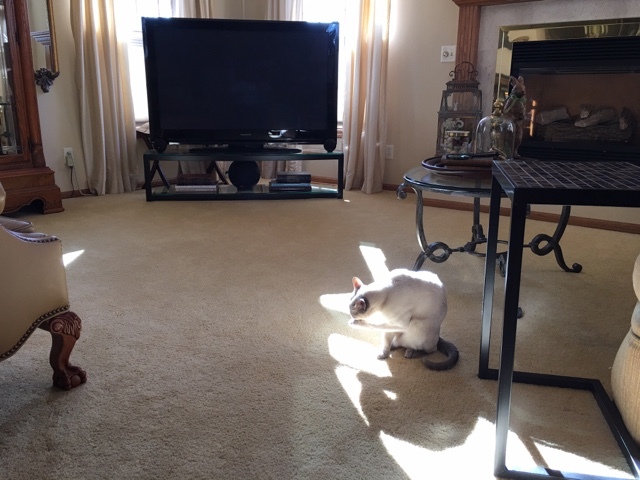 I'd follow a sunbeam around the house if I could! 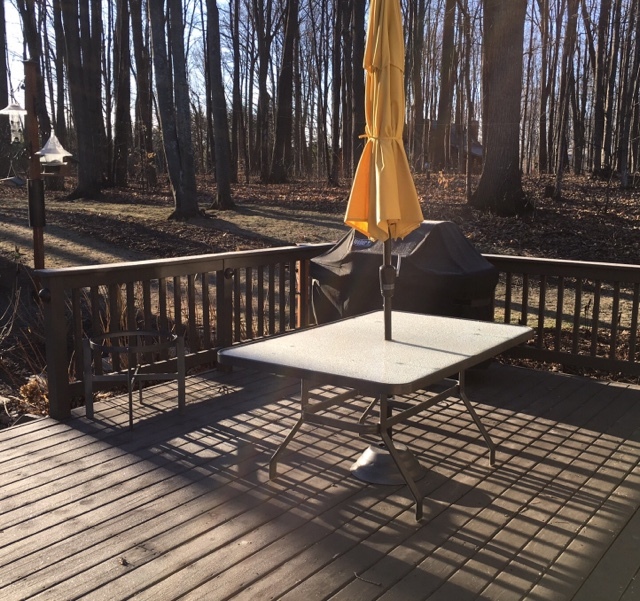 You table and umbrella are all ready for the first gloriously sunny and warm day. A good idea to get them up ahead of time so that you won't be wasting time when you could be sitting and enjoying the sunshine. You caught the sunshine nicely in these photos! Hope you have a very sunshiny first week of Spring! Cats are so clever and Teddy looks lovely, doing his ablutions in the morning sunshine! I can imagine that feeling of cabin fever - especially when you have days that are simply too cold to venture outside. 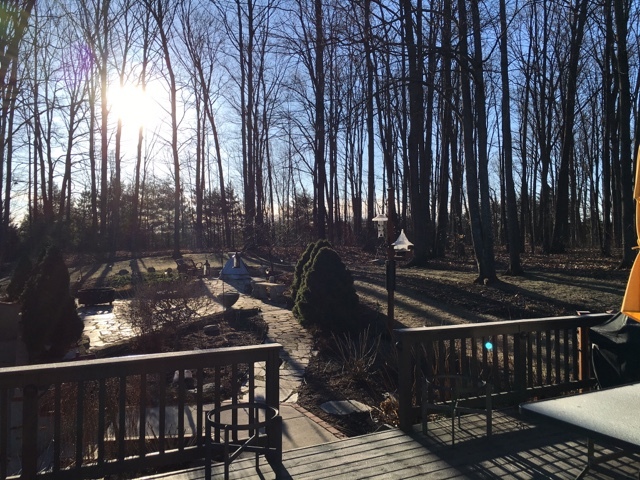 Spring is even more special and I'm not surprised you are ready for the gorgeous Spring days ahead Liz! Isn't morning a lovely time for photography? I love early Spring. Each day some new plant starts to awaken. Your cactus is beautiful! Happy Spring, Liz! You know warmer days are ahead when a patio umbrella makes an appearance, Liz! 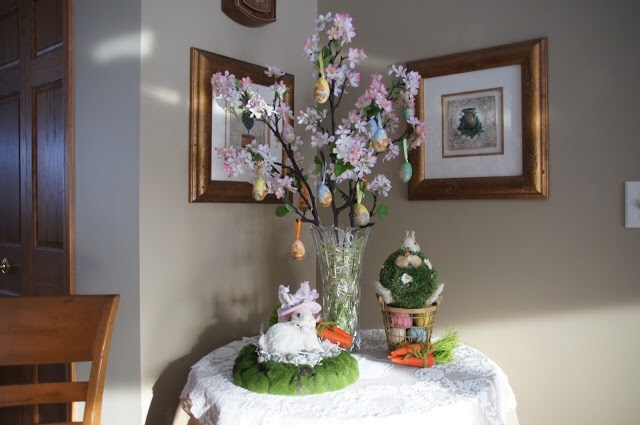 Your Easter touches are very pretty and it's nice that lovely Teddy just follows the sun for fun and doesn't decided to play with the eggs on the tree!